A man is in hospital with stab wounds after being attacked in Doncaster town centre. The 41-year-old suffered stab wounds to his upper body, in what detectives are treating as a 'targeted' attack. He was set upon in Church View at around 5.15pm on Monday. 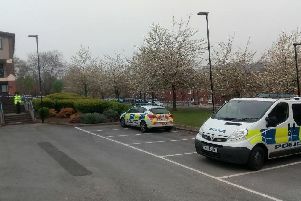 A South Yorkshire Police spokeswoman said: "Detectives are investigating after a 41-year-old man suffered stab wounds in an incident in Doncaster on Monday evening. "Emergency services were called to Church View, Doncaster, at around 5.15pm following reports that the man had been stabbed. "He was taken to hospital, and is receiving ongoing treatment, for wounds to his upper body. Police believe this to be a targeted attack. "At this time, enquiries remain ongoing to identify the offender."